Whether youre remodeling your home or planning new home construction, installing a hardwood floor adds a bit of warmth and grace, raises the homes curb appeal, and increases property equity. Hardwood made of natural wood like oak, maple, or pecan continues to be fashionable with homeowners. Even though laminate flooring is steadily gaining market share, the hardwood flooring manufacturers have responded by making and marketing prefinished hardwood planks that connect with tongue and groove. DIY-inclined homeowners who are novices at finishing wood flooring are best sticking to the prefinished variety or hiring a pro. Finding a pro is easy; but dont play yellow page roulette. I only recommend two methods. Contact additions and remodeling pros for local quotes or find local ratings on who to hire for all your home projects. Angie's List makes it easy to find the best. Join today. Hardwood floor installation hint: Let the planks sit inside the home for at least three days after delivery to stabilize with the interior humidity level. If you need woodworking tools, Rockler Woodworking and Hardware is the most reliable merchant out there. Hardwood floors like an even, solid subfloor to be laid on. This can be a well-finished and moisture-proofed concrete slab, or 3/4 plywood or OSB subfloor glued to and screwed to floor joists. This article addresses a plywood subfloor. 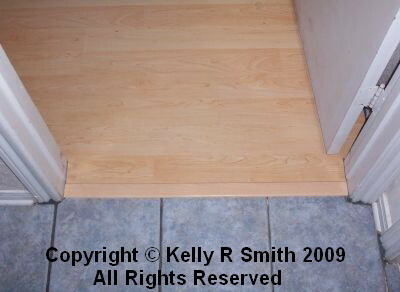 The initial thing to do is to take off any shoe base or quarter round trim on the baseboard. Now, roll out 15-lb asphalt felt. Be sure to overlap seams by 3. Use your staple gun and secure it to your subfloor. The primary purpose of the felt is to keep moisture from the wood. Secondarily, it affords acoustic sound control. Mark it, then snap your chalk line through these marks. You've just marked your control line. Now strike another chalk line thats parallel to your control line. Make it 1/4 from the wall. This represents the border of your first run of wood planks. It also provides for expansion due to humidity. Using your chalk line to guide your work, nail your first run of hardwood down; the tongue side needs to be aligned towards the the room's center. Using a Festool or Dewalt track saw, compound miter saw, or benchtop table saw, cut your planks. Nail straight down close enough to the wall so that your shoe base will be sure to completely cover your nail holes. Feel free to use a hammer, finish nails, and a nail set; or make use of an airless or compressor-driven finish nail gun. I prefer an airless because of the convenience. If you use the hammer, its a good idea (but optional) to pre-drill the holes. Next, nail through the tongue at a 45 degree angle. Next, nail down your next run of planks. The tongue of the first should fit into the groove of the second and be snugged up. Once again, nail right through the tongue. From here on out, no end joint should be any less than 10 from the nearest joint of the previous run. Proceed in this manner nailing down the runs of planks. When you reach the opposite side of the room, you might need to rip the last run at an angle if your room is out of square. Do not forget to allow an expansion gap on the finishing wall. If you used unfinished hardwood, now its time to finish it. Use a floor drum sander and finish with 2 or 3 coats of a urethane. Generally, this wears better than varnish. Next, finish it up with installing your baseboard (if none was there) and shoe base or quarter round molding. Now, all thats left is routine hardwood flooring maintenance.